bofa4x4.co.uk • View topic - I got BOFA'd. Board index ‹ Been BOFA'd ? Have you been BOFA'd? .... Have you seen one of our famous BOFA4x4 logos on your travels? 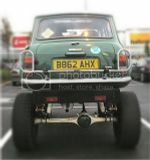 I was invited to the Berkshire show by the Thames Valley mini Club due to they wanted my car on there club stand. If you went I do think you would Know which car I'm on about..... If you didn't I will tell you. Its a Suzuki sj410 with a mini body shell bolted on top. I had to bring it down on a trailer due to at the time I was Having a problem with re-registering it. (Thanks to a jobs worth in a garage, when I went to have it MOT'ed) I bought it as it was off eBay last November with MOT and Tax. It did need a bit of basic attendance like a new clutch, a reline of brakes all round and I don't Know who did the wiring but there was a lot of here's two wire's let twist them together an bung a bit of tape round!!!!! GOON'S!!!! Anyway that all done an things were going very well until like I said that jobs worth kicked in. He said it was registered as a Suzuki soft top. So..... He then contacted VOSA, they said don't touch it until its been re-registered. (so he said). I took all the details, photo's etc to DVLA. At first they wanted me to start from the beginning..SVA it an get a Q plate. SOD OFF!! A good friend of mine took over the challenge. 7 weeks later we got it inspected by DVLA. The result was I could keep my reg but I couldn't call it a mini or a Suzuki. Make of car now is Maine..... That's my surname....Flash aye!!!! MOT is sorted so its back out on the road. Going back to the beginning of this write up at the Berkshire show I got BOFA'd while I was in the arena. I also got invited by you to your Abingdon show but sorry to say I couldn't make it as I was racing my other mini round Castle Combe, will be there next time tho. When I work out how to bung photo's on here I will sort out some. Last edited by Ahh Kid. on Sat Nov 08, 2008 10:00 pm, edited 2 times in total. Noo, let me see, was I at the show? mmmmmmmm nowt tae dae wi me tho. trust me, I'm a man. Here you go mates, managed to bash the right buttons....THE MAINE SPECIAL....TADARRRRRRRR. Dose my bum look big with this sticker? different i guess , whats the vans running gear? Its a ERF tractor unit. If you want to Know more have a shuffty @ uktractorpulling.co.uk web site. There is a link from there to his own web site. Return to Been BOFA'd ?